Anybody out there know the old cowboy ditty 'Hang Me From A Gooseberry Tree'? It tells of a condemned horse thief given the grim option of choosing the tree from which he will hang. The horse thief cleverly opts for a gooseberry tree - and is unfazed when the judge tells him it's unfeasibly low. The song celebrates his patient pledge to "wait until it grows". Now, does that remind anyone of Enda Kenny, the Fine Gael leadership and office of Taoiseach? As a good west of Ireland man he knows his gooseberry bushes and their maximum height. Yes, one more time Fine Gael looks like using up some very scarce energy in a bruising internal struggle over the party leadership. More importantly for the rest of the nation, this peculiar minority Government's already poor focus on the job of running the country is further weakened. 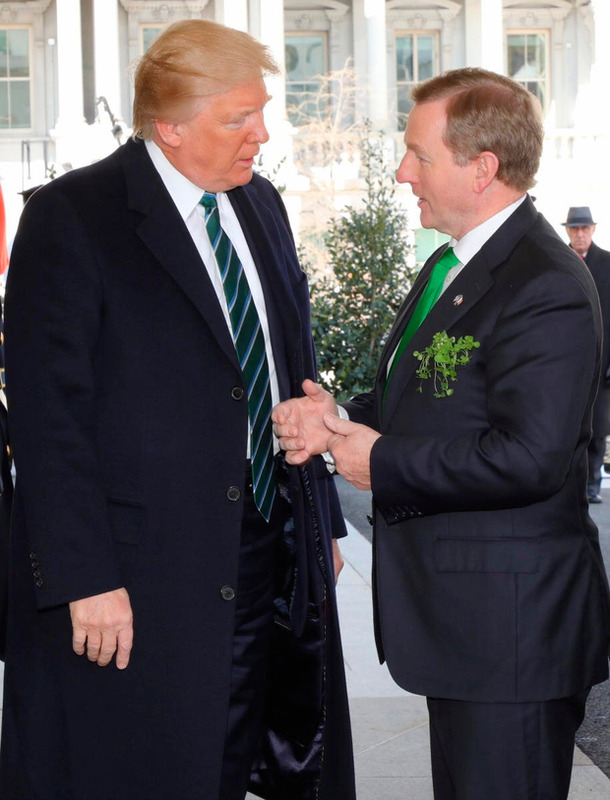 Mr Kenny did very well during his St Patrick's Day visit to the USA. Yet again, he confounded his persistent critics and showed that he "ain't old in politics for nuttin'". His finely honed speech avoided insulting President Donald Trump - but delivered clear messages about immigration and the European Union. Then he ended his trip Stateside by insisting he still has important tasks to complete before he bids adieu to Government Buildings: he wants to remain as Taoiseach until a new power-sharing deal is cut in Belfast; and he wants to see the Brexit talks launched with a set of well-defined terms. We could be waiting a while for either, much less both, of those things to happen. The record of the Northern Ireland parties' ability to negotiate at the pace of a glacier is well documented. And Mr Kenny's fixation with Northern Ireland affairs has been a well-kept secret up to now. He does have considerable EU credentials going back to his debut as Fine Gael leader in June 2002. But like many people in various responsible jobs, Mr Kenny is far from indispensable here. The point is that, before he left for the USA, Mr Kenny had told his party's TDs, senators and MEPs that he would on his return deal "conclusively and effectively" with the leadership issue. Assumptions generally, and political assumptions in particular, are always dangerous things. But many in Fine Gael felt they would have an exit timetable spelt out in this final week of March with a change of leadership happening after Easter. His comments in New York, before he boarded his return flight, suggest we are right back where we started and keeping a good eye on those gooseberry bushes. Few exits from party leadership and high office have been particularly edifying affairs. You really have to go back to 1965, and Seán Lemass quitting as Fianna Fáil leader and taoiseach, to find a clear example of somebody at the top of their trade bowing out on his own terms. Mr Lemass's successor, Jack Lynch, was forced to jump before he was pushed in 1979. Mr Lynch's ouster, Charlie Haughey, made fending off leadership heaves into an art form, until he was forced to succumb to a heave by Albert Reynolds in 1992. Mr Reynolds's departure from office in late 1994 was acrimonious and very brutal. His successor Bertie Ahern became the most successful politician of his generation - but he was obliged to quit in May 2008 amid continuous controversy about his personal finances. Mr Ahern's successor, Brian Cowen, had a most ill-starred term at the helm and was left marooned as taoiseach while his successor as party leader, Micheál Martin, fought a calamitous general election in February 2011. The story in Fine Gael is similar with some particularly vicious internal leadership struggles that match the worst Fianna Fáil wars. Both recent taoisigh, Liam Cosgrave and Garret FitzGerald, were obliged to quit after general election defeats in 1977 and 1987 respectively. From 1990, Fine Gael embarked on a series of damaging internal convulsions. Alan Dukes, who succeeded Mr FitzGerald, was forced out in November 1990. Mr Dukes's successor, John Bruton, spent the next 11 years successfully fending off various heaves. At one stage he was unexpectedly elected taoiseach at the head of a Rainbow Government after an extraordinary sequence of political events. But Mr Bruton finally succumbed to a heave against him led by Michael Noonan and the late Jim Mitchell. Through all his 41 years at Leinster House, Mr Kenny had a ringside seat at all of the events cited above. He was a key participant in several of the Fine Gael internal wars - most notably the botched heave against his own leadership in June 2010, which was the makings of his six-year career as Taoiseach. But, knowing all he does, he must know it is time-to-go time. When the Fine Gael parliamentary party meets on Wednesday, he will be under pressure to be very specific about his departure plans. Otherwise, they will come looking for him.